In the June 2007 edition of the “Scottish Bird News” the quarterly magazine of the Scottish Ornithologists’ Club, there was an interesting article entitled “Windfarms and Golden Eagles, the Argyll Experience”. 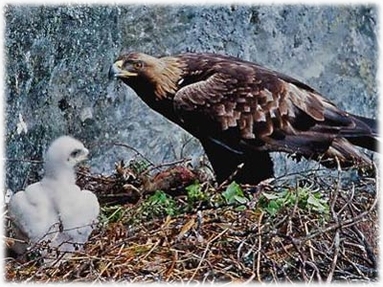 It was interesting in that it gave details of breeding Golden Eagles in Argyll over an extended period of time. The permission of the author, Mike Gregory, has been given for the use of his findings in these notes. In his study, he compared the nesting success at two sites, Beinn an Tuirc and Beinn Ghlas, areas where wind farms were developed, with those of other sites in Argyll outwith the development areas. The data that he used had been collected by members of the Argyll Raptor Study Group over the last forty years on up to twenty nine Golden Eagle territories in Argyll. These individuals were licensed by Scottish National Heritage (SNH) to visit each territory throughout each breeding season. Meticulous records were kept. These included: whether or not the resident adult birds were present in the territory; whether or not there was an active nest; the number of eggs laid; the number of chicks hatched; and the number of birds who fledged. The Beinn an Tuirc data was compared with all other Knapdale and Kintyre sites. The Beinn Ghlas data was compared with other Argyll sites. At the Beinn an Tuirc site, the last time a chick was reared was in 1997 when survey work for the wind farm started. Since wind farm construction work started in 2001, breeding productivity has been zero. In both 2006 and 2007, no eggs were laid and the resident male had disappeared. In marked contrast, the remaining pairs in Knapdale and Kintyre have all bred successfully on at least one occasion during the same period since 2001, rearing twelve chicks in total. At the Beinn Ghlas site, wind farm construction started in 1999. Since then, there has been no evidence of occupation by a resident pair of eagles. The territory appears to have been abandoned. During the same period the two adjacent pairs of eagles have each successfully reared three chicks. With our rich bird life on Arran we would do well to reflect on this Argyll experience. For the full report prepared by Mike Gregory of the Argyll Raptor Group click the link on the left.